Raspberries are extremely delicate. 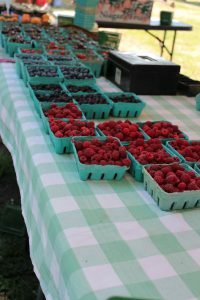 It’s best to pick your own or buy from a farmers’ stand or market. Picked these wee beauties at the Riverdale Farmer’s Market in Toronto. I leave them for the last purchase of the day when I buy them at my farmers’ market. Do not wash raspberries until just before you are going to use them. Rinse and drain well in a colander. Let air dry on paper towels or tea towels and then use right away. 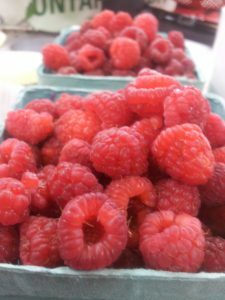 About 94% of all the raspberries sold in Canada during raspberry season come from Abbotsford, BC, the Raspberry Capital of Canada. A one cup serving (250 mL) provides you with 34% of your daily requirement for fibre and they sure taste a lot better than downing a commercial fibre drink. 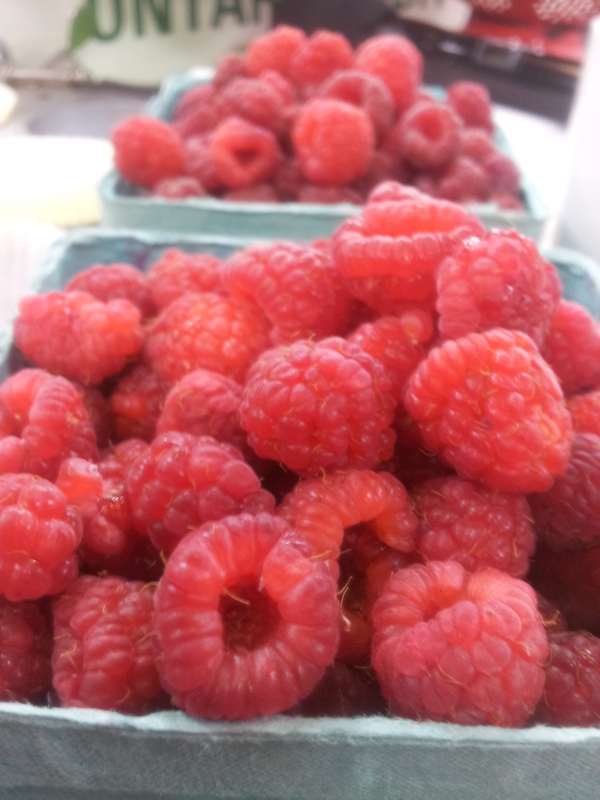 oh raspberries, oh rapture, my favorite berry. nay, my favorite fruit. double nay, perhaps my favorite food! some of my best memories are of being at the cottage with my grandfather. each morning he would serve me raspberries and cream, fresh picked from his berry patch. the cream just poured from the cow, well, maybe i made up the cow part, but i swear the berry patch was real. i remember once he served me a tiny green spider with the berries. i removed it gently and continued with my breakfast. or said ew grandpa, or some such. but i do remember i sure finished the bowl. of berries. not spiders. thanks for reviving the memories mairlyn,( hmmm sounds like a song title) and the recipies. i especially like the fool. i think i might serve it to a few of my fools the next time they’re over. Want to be the first to know when I've posted? Enter your email here to keep in touch (I promise it's just for me to use)! You'll get an email to confirm your subscription, so be sure to check your email and click the link to complete signup! © 2018 Mairlyn Smith. All rights reserved.